This handout graphically illustrates how the spine and nervous system relate to complete neurological, musculoskeletal, and visceral function. 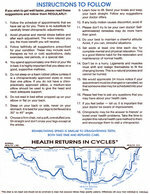 NOW THAT YOU'VE HAD YOUR FIRST CHIROPRACTIC ADJUSTMENT... WHAT NEXT? 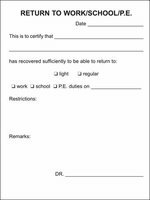 This exam form is ideal for CA's and new exam doctors. The easy-to-follow format includes pictures that help maintain order, efficiency and testing flow. - More space making it easier to review patient information and add note documention. - Thorough documentation on health complaints and patient treatment interests that can increase the efficiency of the initial consultation. The same great features found on all of our nre forms! 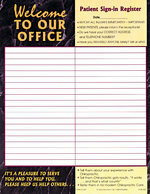 This foldong form is perforated so the binding fold can be seperated for easy future file reading. PACK OF 100 - 8.5" X 11"
Most practices are unaware of the value of documenting patient satisfaction with your initial procedures. 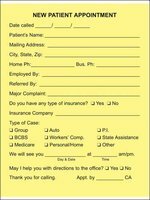 This form is a terrific risk management tool and patients appreciate that you are interestedin their feedback.The Patient Questionaire works hand in hand with our Patient Treatment Plan to document patient acceptance of your care plan, patient satisfaction, and patient intent. Never hunt for patient information again. 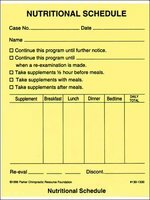 The Patient Registration Form keeps contact, personal, emergency, spouse/guardian, and employment information easily accessible along with tye appropriate patient notices concerning acceptance of care; purpose and authorization for a consultation, exam, and X-rays; and advisory of costs associated with future recommendations. 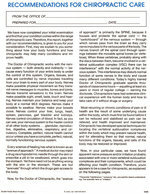 This pamphlet provides an easy-to-read summary of chiropractic and health, documentation for care recommendations and office visits, a subluxation nerve chart, and instructions for the new patient. This ten page Report of Findings has been a long-standing favorite of many clinics. 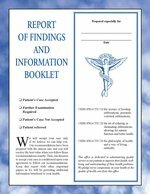 It features documentation on case acceptance, a welcome letter, detailed information about the spine's role in health, documentation for recommendations, and special new patient instructions. PACK OF 25 - 8.5" X 11"
Your image is priceless. Compliance and referrals are related to the amount of trust and confidence patients have in their doctor. Use this Report of Findings Magazette to project a thorough and caring impression. The photographs, illustrations, X-ray examples and step-by-step layout create a concise message that turns your report into a powerful communication event for the patient that they can take home and share with co-decision makers and others who need chiropractic care. Completely referenced with up-to-date citations, this Magazette is essential if you want to give patients a substantial, high quality, take-home representation of their current condition.